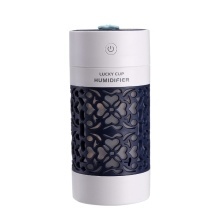 The air humidifier is multi-functional as fan, night light and humidifier. It can increase air moisture, optimize your living space, to prevent drying, keep the skin moist. If there is no water in the humidifier or the humidifier is slanted, it will automatically cut off power, safer to use. Ultra quiet working condition, diffuse your room in low lb. Remove the stink smell in your room. Atomized dust, improve the air condition. Automatically cut off power itself if there is no water available. 7 color beautiful night light. The USB fan and USB night light is not included.